Shared human experiences with water along the Solomon River from Glasco to Hoxie, Kansas. The Solomon River was vital to powering the growth of commerce along the valley. 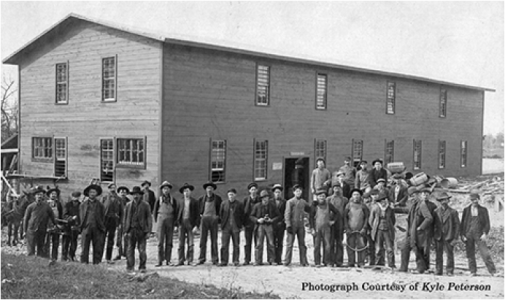 Aaron Bell arrived in Mitchell County in 1866 and a year later he built a saw mill, the first major business in Willow Springs, now known as Beloit, Kansas. Water power very soon became the life blood of the area. Where ideal spots for water dams appeared, so did towns. The early grindstone mills were a major economical booster for these growing communities. In those days farmers were only grinding on average 100 bushels of grain and that flour was their bartering commodity. As villages became towns, more money was invested in updating the mills to steel roller style. These mills were able to handle more grain, driving the demand up for the farmers, allowing them to expand their operations. The Simpson, Kansas mills for a time were using the old and new styles until the flood of 1911 destroyed the old mill. ​Harnessing the power of water by water wheels, later by water turbines, allowed some communities to power their entire town, as seen in this 1895 picture of the electric plant alongside the grain mill in Beloit. ​Water was used as a source of power, even when it was frozen. Ice was cut from the rivers in large. blocks and stored by the tons in underground ice houses all year. This ice was delivered to businesses and homes to keep food cool. Grind Mill, Solomon River, Simpson, KS. Electric Plant along Solomon River, Beloit, KS. Cutting Ice from Solomon River, Glen Elder, KS. ​October 17. 2 o’clock. Reach Minneapolis, four miles further bluff near river. A flour and saw mill by water of Solomon.